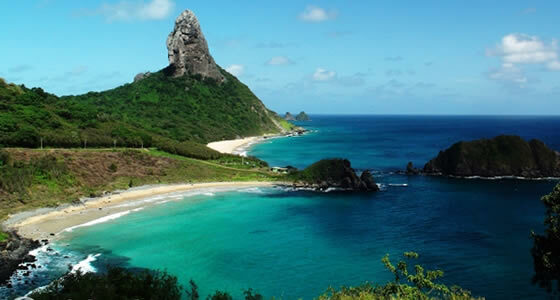 Praia do Meio Beach, Fernando de Noronha, Brazil. Praia do Meio makes for good swimming and bathing in its natural stone pools, when the sea is calm on this beach. Praia do Meio is situated between the Cachorro and Conceicao beaches, hence the name Praia do Meio which means the middle beach or the beach of the middle as the natives address it. The shape of this beach resembles a small bay and can be easily accessed through an easy terrain leading from both the Cachorro beach and the Conceicao beach. On the borders of Praia da Conceicao you can see the Pedra do Piao also known as the spinning top, a huge rock on top of a base comprising smaller rocks. This balancing rock has the experts believe that there has never been an earthquake in this island. When the sea is calm on this beach, the visitors enjoy swimming and bathing in the natural stone pools, which is otherwise restricted when the water is turbulent. Surfing is also permitted here when the wave conditions are suitable. Tourists enjoy taking a walk between these beaches since the path is short and quiet easy. Praia do Meio is also fairly crowded because of the warm water which is very calm and perfect for swimming and the waves breaking on this shore give an enjoyable time of surfing for those who enjoy the water sport.